Hi! It's Funkie time at the Frilly and Funkie Challenge Blog. The current challenge is hosted by the extremely talented Kathy and she is challenging us to re-purpose, re-use, or re-cycle something. "Earth Day is April 22nd, so let's honor the day with a vintage or shabby chic project that includes an item that would normally land in the recycle or trash bin. You can use an old jar, glass bottle, packaging material or other bits and bobs to create your up-cycled masterpiece. Be sure to tell us in your post what your recycled item is and how you used it, as it may not be apparent in the photo." I was ready for this challenge! I have a stash of re-cycled items. I pulled out a variety of things and added to the pile after I started my project. I have these cute boxes my husband is getting from his shaving supplies and I love how sturdy they are. I decided to cover it with old ledger paper and cut the pieces to cover the sides of the box. The box came together with bits and pieces. I die cut a bunch of flowers, butterflies and leaves from kraft packaging paper, paper bags and scraps. After I covered the box with the ledger paper I covered the edges with design tape. Next I sponged on distress ink over the layering stencil to add a slight pattern over the ledger paper. I used a pair of pretty kraft paper butterflies as the main focal point on top of my box. I spread crackle gold embossing paste over the layering stencil to give them a frilly touch. I made sewing pattern paper roses from the tattered pine cones. The texture of the sewing pattern is like a nice tissue paper in a pretty neutral color. I finished the flowers with a shower of tarnished brass spray. Some vintage snaps were embossed with gold embossing powder to add a sparkle and I added the same gold edging to the other embellishments. The inside is stamped with a simple quote. I hope this has inspired you to pull out your re-recyclables and join us in the fun! Hi! 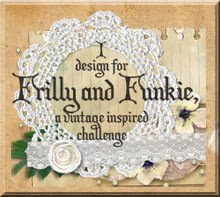 Suzz here to share the Frilly and Funkie challenge with you! Don't be afraid because the challenge is called "March Madness", the challenge isn't going to require you to use basketball inspired images. Instead I asked everyone to be inspired by Alice in Wonderland. I started from this quote of a conversation between the Mad Hatter and Alice: The Mad Hatter asks Alice: "Have I gone Mad?" and Alice replies "I am afraid so. You're entirely bonkers. But I'll tell you a secret. All the best people are." 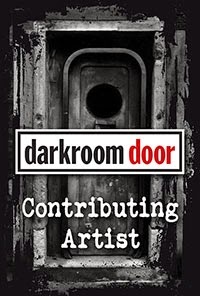 I was thinking about how she went through multiple doorways and decided to create a shadow box with a door. I tried to use the different baseboard size dolls to find a little one and a large one for her shrinking and growing but wasn't successful. I created a faux door with some cardboard, Seth Apter Baked Velvet embossing powders along with the Charred Gold embossing powder and stencil. I wanted a looking glass effect so I used some metallic cardstock and stamped an image from Artistic Outpost. This was a fun project with bits and pieces that I have been keeping for awhile. You need to go see all the wonderful design team projects celebrating Alice's adventure and hopefully get inspired to share your March Madness!
" Since we are still in 'cold season', I always make sure I'm stocked up on tissues in my home, in my purse and in the car. 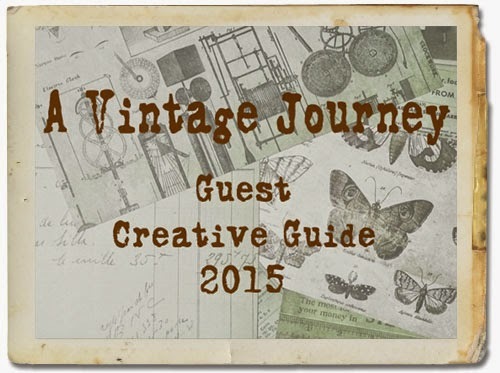 For this theme, I would like to see how you incorporate tissue paper into your vintage or shabby chic project. You can use regular tissues, tissue wrapping paper, sewing patterns or even collage paper, rice papers or tissue wrap designed especially for crafting." Tissue paper? Yes Please... I love playing with tissue paper because of the transparency. Sara Emily gave a bunch of ideas of different types of tissue paper but I went with the plain left over pieces I had after Christmas. Sometimes I feel like a squirrel grabbing bits of things and hiding them away to be used later when needed. I dug out some tissue paper and because I had the lovely new wildflower dies on my desk I decided to cut them out of tissue paper. I saw this beautiful card on-line. (I would share it but honestly don't remember where I saw it) The card was on a kraft background with striking white die cut flowers. 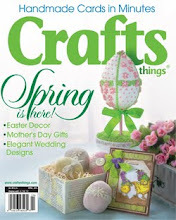 It had me thinking about using my tissue paper flowers on kraft. After I realized I had to get the tissue paper flowers onto the paper, I realized I was going to have to get creative to get the impact I wanted. 1. Die cut 3 layers of tissue paper with various flowers. 3. Let dry and pull apart layers. 4. Ink up the flowers with Versamark Watermark Ink. 6. Cut front of card. 7. Stamp with background fragment with antique linen ink. 8. Versamark inked background. Cover in embossing powder. 9. Lay flowers onto inked background. 10. Sprinkle more embossing powder over flowers and inked background. 11. Heat up the entire sheet of cardstock from underneath. This will keep the embossing powder in place and fuse the flowers in spots to the inked background. I love how this turned out and can't wait to use the rest of my tissue flowers! Check out all the fabulous work the design team created and come and join us in the challenge. The winner will earn the chance of a Guest Designer spot at Frilly and Funkie, and everyone who enters and follows the rules will go into the draw for the chance to win a $25 spending spree at The Funkie Junkie Boutique. And there are Top 3 Badges for three further outstanding entries, chosen by the Design Team. The challenge is to create an Artist Trading Coin. I was inspired by a new way of capturing a little bit of art to share with others. Your challenge is to create a trading coin which should be a circle shape 2 1/2 inches in diameter. I have to admit this challenge was a bit addicting for me as I kept creating different types o ATC's. Once I cut a variety of circles I pulled out some new stamps and just started to create. I really like designing in small spaces. I think I like it because you have the opportunity to cut off part of a stamp or image and create a different view or focal point. I started with the new flower stamps from Dina Wakely and stamped them staggered. I wanted them to be softer so I could stamp over the sentiment. This actually measures 2 3/4" in diameter to accommodate the sentiment. I also added a slightly larger circle so I went over my size on this trading coin. For my second ATC I decided to use the same flower stamp set but stamped it multiple times on old dictionary pages. I wanted to see if I could get textured layers. I used the full flower image and stamped, embossed and cut out the layers to create my printed flower. I added a little bee to the petals from another Dina Wakely stamp set. I then decided to pull out the paper dolls to use up a leftover yellow background from the previous ATC. With just a few pieces of ephemera, stickers and rub-ons I was able to quickly assemble another ATC. I die cut all the pieces and sponged them with the lovely soft Distress Oxide Inks and layered them onto a dictionary page background. My final ATC was a mix of leftover scraps. I wanted to try something with pretty spring colors and a die-cut butterfly started me down this path. I hope this has you inspired to come share your circular art! The winner will earn the chance of a guest spot here at Frilly and Funkie, and everyone who enters and follows the rules will go into the draw for the chance to win a $25 spending spree at The Funkie Junkie Boutique. In addition, the Design Team will select three further outstanding entries and those creators will receive a Top Pick badge to display on their blogs! Hi! I wanted to share a few cards I made using the new Filmstrip stamp from Darkroom Door. I had fun stamping the strips and then coloring them with watercolor pencils and waterbrush. I used them to create a very graphic design with the stamped sentiment from the Capture Life Stamp Set from Darkroom Door. I love how graphic and striking the filmstrip in black ink is and I added just a hint of yellow the the flowers on this card. Howdy! Time for the Funkie side of the Frilly and Funkie Challenge! The talented Sara Emily is hosting the challenge and her challenge this time is "Let Me Count the Ways". "Since it's just a day away from Valentine's Day, the opening line of Elizabeth Barrett Browning's famous love poem "Let Me Count the Ways" (Sonnet 43) comes to mind. "How do I love thee? Let me count the ways." 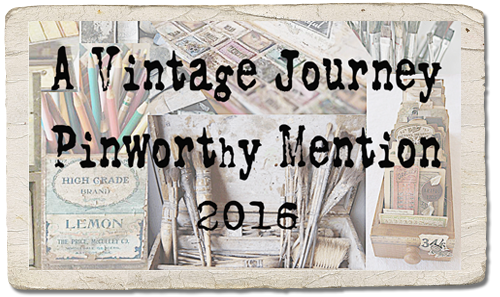 For this challenge, I would like to see your vintage or shabby chic project that includes three of something. This could be three colors, three words, three stamps (you get the idea); just be sure to tell us what those three elements are." Using an odd number of elements is something I learned early on in designing my cards and other projects. One of the classes I took the instructor said it helps the eye follow the design when you use three (or odd) number of elements. I decided to use three of one die cut image and layer them to give depth. I also followed the idea of three with my brads. I started with a brown kraft bag given to me from a local merchant when I purchased something. I painted the background with a coat of white gesso. I then stenciled with crackle embossing paste a pattern on the top and bottom. I let that dry and smeared with distress crayon and dye ink pad. Added a spritz of water to soften the effects. Let that dry. I then die cut the bird multiple times in white cardstock and cardboard. I wanted some depth so the cardboard birds were used to stack and layer 3 times. I painted all the cardboard birds with white acrylic paint. I cut out a bird from white cardstock which I used to stamp the script and the flowers. I attached the stamped bird to my top layer. I then cut out the clock frame and attached it behind the bird with the filmstrip and my 3 brads. I added the quote chip to give a little punch to the top of the bag. Now I have a cute gift bag for someone who love to travel and take the journey! Come show us your groups of three! The winner will earn the chance of a Guest Designer spot at Frilly and Funkie, and everyone who enters and follows the rules will go into the draw for the chance to win a $25 spending spree at The Funkie Junkie Boutique. 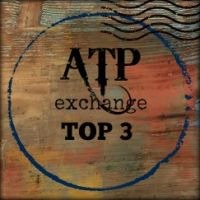 And there are Top 3 Badges for three further outstanding entries, chosen by the Design Team, because choosing just one winner is so hard! Prima Art Extravagance: Texture Paste White Crackle 8.5 fl. oz. The Funkie Junkie Boutique, Canvas Corp Brands, Verses Rubber Stamps, Stampendous, Artistic Outpost, Simon Says Stamp, PaperArtsy, Memory Box, Dark Room Door, STAEDTLER, Basically Bare, Canvas Corp Brands, 7 Gypsies, Tattered Angels, The Funkie Junkie Boutique and other companies supplied me with complimentary product for promotional purposes. I am very pleased to have the opportunity to create projects with their products. All of my content, including but not limited to text, photographs, images and concept design works are ©2015, 2016, 2017, 2018 Suzanne Czosek, the original creator. They are shared for personal inspiration only and may not be copied for the purpose of sale, publication, or contest submissions. 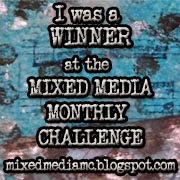 The only other information Blogger collects is limited to name and your Google+ or blog link when you leave a comment. Third-party affiliate links in my blog posts and sidebars have their own personal privacy policies in regards to the use of any personal information you share with them.